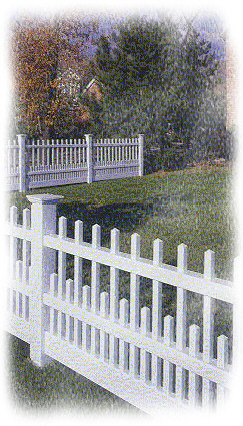 Bufftech's Classic poly vinyl fence designs meet the needs of today's demanding lifestyles. A durable, yet virtually maintenance-free vinyl fence adds value and aesthetic appeal to any property. Many of the vinyl styles and heights meet most pool codes. Check with your local authority before ordering your vinyl fence. 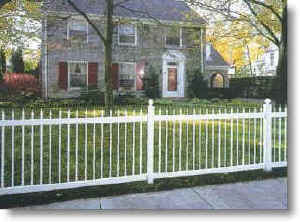 Bufftech Vinyl Fence is not plastic fence, its a poly vinyl! The Canterbury design is distinctively different from all other vinyl fences. The combination of vinyl 1-1/2" Square pickets and the staggered vinyl picket feature brings old world charm and beauty to this new concept vinyl fence. If the look of colonial life is what your vinyl fence project is looking for than Bufftech's Canterbury Vinyl Fence is the answer. Lower Spacing 30 spaces of 1 9/16"
Upper Spacing 15 spaces of 4 5/8"
15- Lower Pickets 1-1/2 x 1-1/2"
14 - Upper Pickets 1-1/2 x 1-1/2"
Vinyl Posts: 5" x 5"
Boca Pool Codes: Does not meet Boca Pool Code. Tom Sawyer would never have had to get out the white wash if Bufftech's Manchester Vinyl fencing were in front of his house. 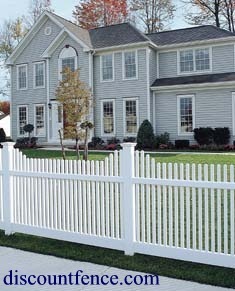 The Manchester Vinyl Fence comes in both straight and concave styles. 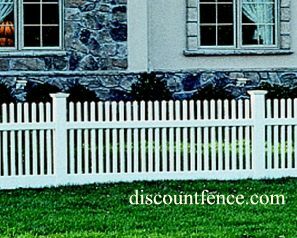 This distinguishing vinyl fence offers the 1-1/2" square picket that slips and locks into the bottom rail. Each section of this striking vinyl fence is 8 ft long. 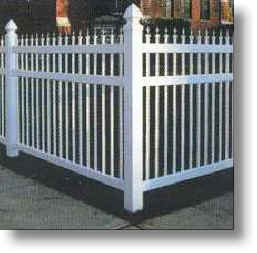 You may add the Fluted or Recessed vinyl fence posts to add a finishing look to your project. 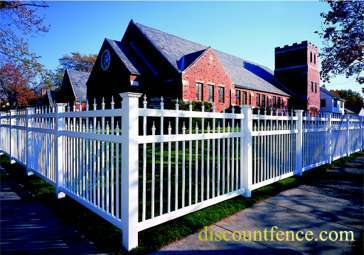 Vinyl Picket Size: 1 1/2" x 1 1/2"
Top Rail Size: 2" x 4"
One of the major problems of wrought iron fence is the maintenance that is involved. With Bufftech's Normandy vinyl fence maintenance is never a concern. No more scrapping and painting with vinyl fence. Bufftech offers a factory limited warranty against cracking, pealing, or fading on all its vinyl fence products.